Under Maryland law, bad check crimes fall under the fraud statute, which includes crimes such as identity fraud, public fraud, and credit card crimes. The check fraud laws in Maryland basically criminalize the act of obtaining property or services with checks that a person knows will not be honored. There are a variety of ways that the Maryland law defines how a defendant can knowingly use a bad check. There are also a variety of defenses available to criminal lawyers in bad check cases that a Maryland bad check lawyer can explain in detail. 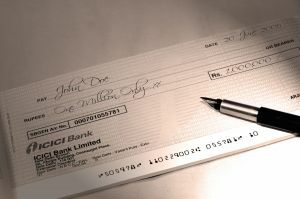 The most common form of bad check case is the criminal act of issuing a check with the knowledge of insufficient funds. Insufficient funds can include circumstances when a defendant knows he or she does not have funds with a drawee to cover the check and other outstanding checks or if he or she knows that a drawee will refuse to pay the check. A drawee is simply a legal term for the person or institution that is ordered to pay the designated amount on the check, most commonly a bank. The Maryland fraud laws also cover bad check cases where a person issues a check with the intent to stop payment without the consent of the payee. In this instance a defendant may have sufficient funds, but decides to stop payment anyway. Finally a person may not issue a check when he or she has reason to believe that the bank or other drawee will refuse to honor the check. In Maryland, the maximum penalty for obtaining goods or services valued at less than $100 with a bad check is 90 days in jail, and 18 months in jail for obtaining goods or services between $100 and $500. If a person uses a bad check to obtain property or services valued at $500 more, he or she faces a felony fraud charge with a maximum penalty of 15 years in prison. The value of the goods or services obtained is added together to reach a total amount if the check fraud is carried out in one scheme or plan. Many times check fraud cases will have alleged victims, and the prosecuting lawyers will often consult with these alleged victims for a sentence recommendation. This does not mean that check fraud victims will have the final say in a defendant's sentence by any means, but they can have an influence. For more information on possible sentences for a bad check case contact a Maryland check fraud lawyer at The Herbst Firm. Like most fraud cases in Maryland, bad check crimes required that a defendant have the intent to defraud another person. It is not a crime for a person to pay for goods or services with a check that he or she reasonably believes will be honored. In order for prosecuting lawyers to file criminal charges, there must be evidence of criminal intent. A person may still be liable in a civil lawsuit for writing a check that does not clear, but without the intent to defraud there can be no criminal prosecution. In all criminal cases a defendant is not required to prove his or her innocence, but rather the prosecuting lawyers are required to prove guilt beyond a reasonable doubt. In Maryland fraud cases, and especially bad check cases, many innocent defendants are placed in a position where they feel that their criminal lawyers will have to prove their innocence. This should not be the case! An experienced Baltimore criminal lawyer will constantly remind jurors that they are prohibited from making assumptions of guilt in all fraud cases and will fight for your rights pretrial, and during trial.